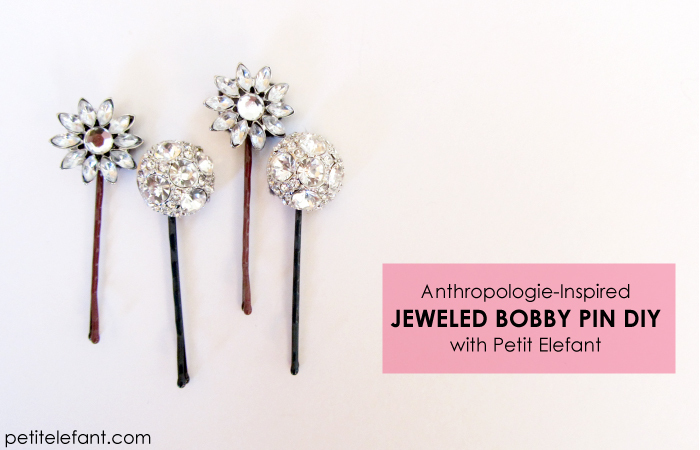 This week: make jeweled bobbies from earrings (inspired by Anthropologie jeweled bobby pins). Hello again! Steph here to show you yet another fabulously easy DIY project you can make with simple materials you probably have around the house. 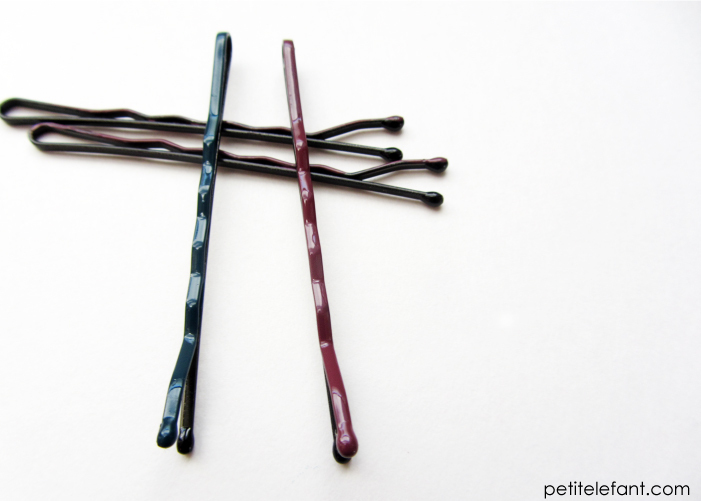 Paint the top of the bobby pins and let them dry. 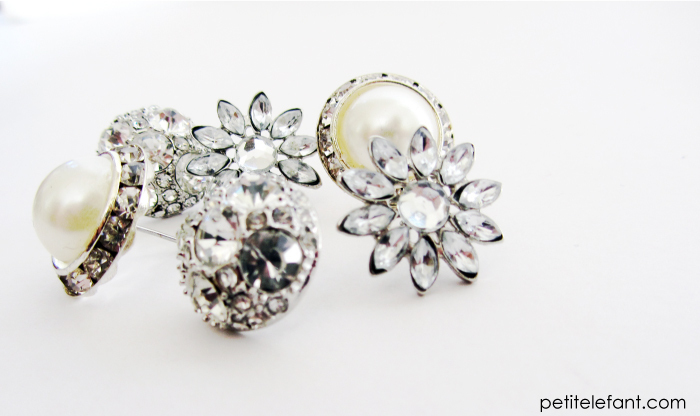 While the nail polish dries, go ahead and snap off the stems from the back of the earrings. A few bends with pliers snapped those stems right off of my earrings. Cut out tiny squares of felt and glue them to the back of the jewel. Make sure it’s small enough so you don’t see bits of felt sticking out from the front. 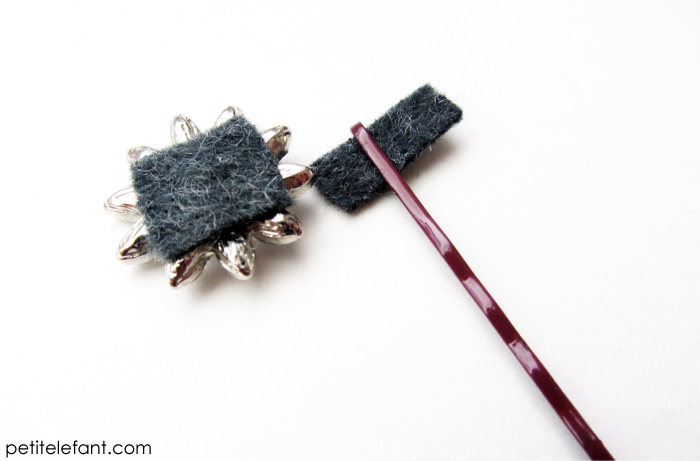 Then cut an even smaller piece of felt and “thread” it through the top of the bobby pin. Hot glue the smaller piece while it’s still in the bobby pin to the back of the felt on the jewel. Let it dry and voila! 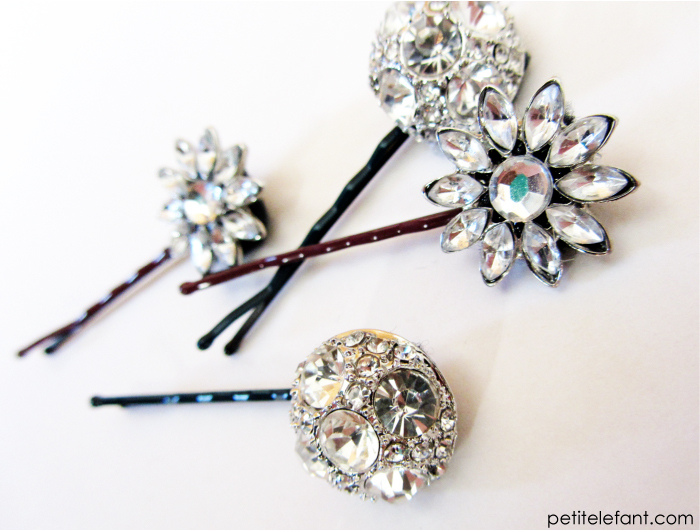 Bling for your hair! 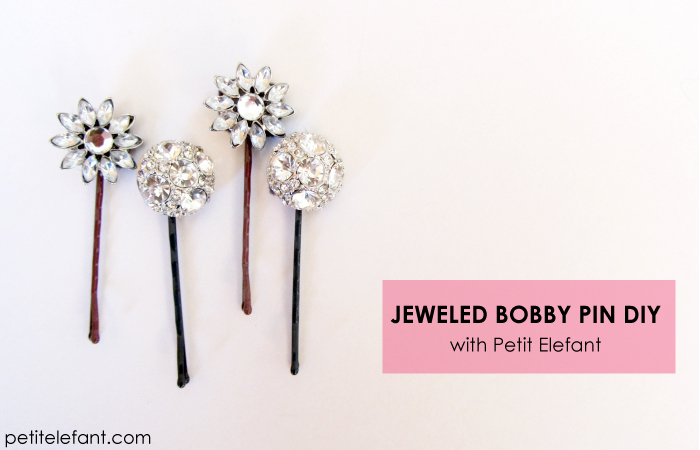 You could also make embellished bobbies with buttons, charms, pins, really anything with a flat back. (I feel like I say this in all these posts, but) The possibilities are endless! That’s the best part of DIY, you get an opportunity to put your own creative spin on a project to make it unique for you! I didn’t quite get the “threading” part…could you post a picture of what I’m supposed to do? Cha – Thanks for your question. The picture right below the list of materials explains it the best. 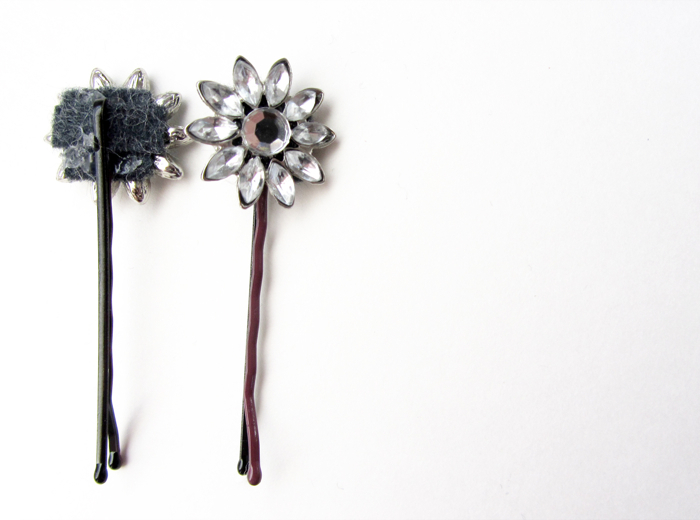 Simply put the smaller piece of felt in between the two pieces of metal at the top of the bobby pin–right where the metal bends. This way when you glue that piece of felt to the felt on the jewel, it will be secured onto the pin. Make sense? Great idea! Especially since i’m always losing the “other half” to my pair of earrings. Gonna try this one! I am Indian and so I have soooo many chunky earrings that I rather die but wear in my ears. I can definitely… though wear them in my hair! Superduperness! I really like these and am making some tonight. I didn’t find the “right” gems for them but these will work. :) Thanks. Those are so cute! I really like how you painted them with polish first to give them that extra Bump of style!